Ti Kuan Yin (Ti Guan Yin or Iron Goddess of Mercy) is lightly oxidized oolong tea, that is characterized as being close to a green tea. While the descriptions on the packaging and the website differ (with the packaging being a better description), one thing is for sure: this tea tastes like a Ti Kuan Yin. The reason I make that statement, is that the website I bought this tea from had me leery of their product. The prices of their loose leaf teas are generally quite low. The prices of the teas is also determined by how much you buy, the more ounces of tea you buy, the cheaper each ounce is. Because of the low prices, I decided to buy many teas I have not tried, as well as teas I knew well. As Ti Kuan Yin is one of my very favorite teas, I felt that it would be a good gauge of quality. To brew the tea, I used the same process as I do with the rest of my oolongs, using a glass gaiwan, poured into a small glass pitcher, and drank it with a porcelain tea cup. The water was filtered and heated with an electric kettle to 180 degrees, and brewed for 2 and a half minutes for the first steep, and 3 minutes for the second. This tea didn’t knock my socks off, but it was good. It did not have a flavor that lingered for a long period of time, nor did it have quite as round and beautiful flavor as many other I have had. The tea though gets extra points for being so inexpensive ($1.75 for an ounce). The tea is a wonderful way to introduce someone to Ti Kuan Yins and oolongs, as it has the base flavors without all the complexities that can get lost through improper brewing or treatment. They also offer more expensive and higher quality Ti Kuan Yins such as a “Monkey-Picked” ($16.80 per ounce) and their “Superior” ($4.25 per ounce). You can order this, or many other teas from their website or follow them on Twitter. This entry was posted on September 15, 2010 by W. Murdock. It was filed under Tea Reviews and was tagged with iron goddess of mercy, Oolong, Tea, Ti Kuan Yin. Thanks Jordan. I like the Iron Goddess, though “she” can sometimes disappoint, depending on who you buy from. Glad you found one you thought was pretty good, for an affordable price. I wonder how this sample would compare to one of their high end ones? I would hope that their higher end TKYs are much better, but for $16+ per ounce, I would like to have clearly stated origins and batch numbers before I buy it. I would on the other hand be willing to compare their “Superior” to their “Fine” as it is priced reasonably as well. Yeah, sorry I didn’t clearly mark it as mine, but Jordan went ahead and added the note at the top. This is unusually expensive for a Tie Guan Yin. I’ve never found one for that price that I really enjoyed. I have, on the other hand, found Se Chung Oolongs (other oolongs from the same county, Anxi, in Fujian province) that are similar or even lower in price that I have absolutely loved. If you’re looking for value in greener oolongs, I’d recommend looking trying some of the se chung oolongs if you have not already. 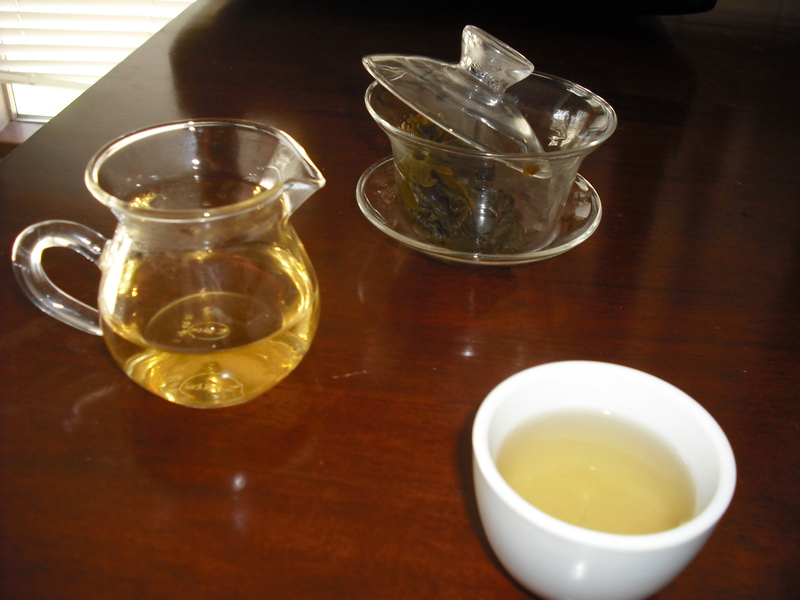 Some, like Ben Shan, are very similar to Tie Guan Yin, whereas others, like Mao Xie, are radically different. I actually was very surprised at its price as well, and could not pass up the opportunity to find a steal of a deal. It doesn’t quite make it as an every day drinker like Utopian Tea’s, but it will make a great way to fill the void if I run out at any point. I will definitely check out your recommendations because I can never have enough oolong choices in my stash. I really appreciate you giving the recommendation. 180 degree water for a Tie Guan Yin? I am interested to know why you don’t use 195 or so. I use hotter water so I am just curious, not judgmental, haha. Actually, I tend to to vary my temperatures when I have oolongs because you can get so many infusions out of them. I will usually either increase temperature or time that it brews, or both sometimes. I think that for a first infusion, 180 degrees gives a good starting point to give you an introduction to the tea with a slightly subdued flavor, and it sets up the second infusion to really shine.